Music copyright in Nigeria seems to have made a big turn into a new era following the recent meetings between,Chairman, Broadcasting Organisations of Nigeria (BON), Mr. John Momoh and the COSON team.Momoh has pledged that he will co-operate with COSON to ensure that all broadcasting stations in Nigeria pay agreed music copyright royalties in fulfillment of the obligations of the stations under the COSON/BON/IBAN/NBC/NCC/ Agreement of 2014. BON and that of Copyright Society of Nigeria (COSON). The BON team to the meeting included the organization’s Executive Secretary, Mr. Segun Olaleye and Mr. Kenny Ogungbe of DAAR Communications. 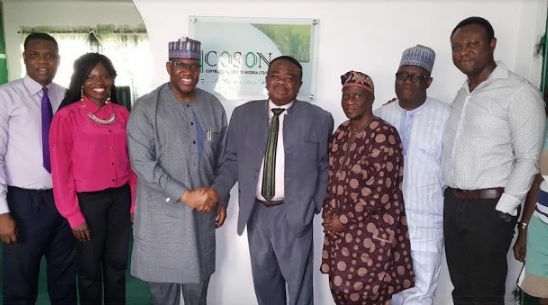 The COSON Representatives led by the society’s Chairman, Chief Tony Okoroji, had General Manager, Mr. Chinedu Chukwuji and two other members of the COSON Board, Mr. Efe Omorogbe and Mrs. Azeezat Allen. Chairman, Copyright Society of Nigeria, (COSON), Chief Tony Okoroji commended the new Chairman of BON for taking the bull by the horn and creating the atmosphere for peaceful resolution of the issues. He also commended Mr. Momoh for showing good examples by making sure that Channels TV continuously fulfils its copyright obligations to COSON. Chief Okoroji said that COSON remains committed to ensuring that Nigeria is a nation in which intellectual property rights are highly respected because according to him, respect for intellectual property is critical to tapping the significant economic potentials of the nation’s creative industries for national development. He also said that he remains fully dedicated to complete transparency, accountability and comprehensive reporting to the different COSON stakeholder groups which he said are the hallmarks of the success and continued growth of COSON. In recognition of the prevailing economic situation in the country, one of the key decisions taken at the meeting is to extend the life of the 2014 royalty agreement meant to terminate in December 2016. The agreement is now to terminate in December 2017 without any increase in tariffs. Mr. Momoh thanked the COSON leadership for the gesture. It was also agreed that the two organizations meet regularly to review developments.